Senior guard Jeremy Hemsley embraces his teammates in the closing seconds of the Aztecs' 64-57 loss to Utah State in the Mountain West Conference tournament final on March 16 at the Thomas and Mack Center in Las Vegas. 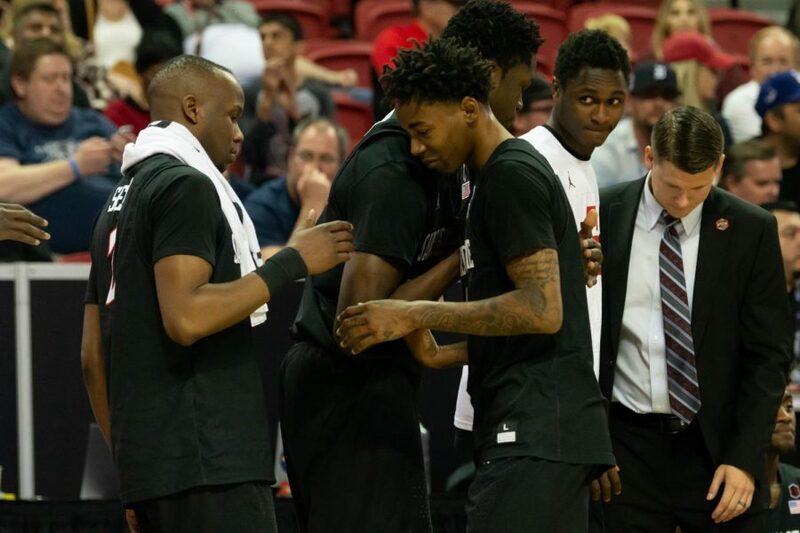 San Diego State senior guard Jeremy Hemsley fouled out with 28 seconds left, and as he headed back to the bench, he embraced many of his teammates and coaches. Collectively, the Aztecs’ postgame environment in the locker room was dominated by one thing. Emotions flowed for SDSU, following a 64-57 loss to Utah State in the Mountain West Conference tournament championship game on Saturday at the Thomas and Mack Center in Las Vegas. Hemsley said he was full of emotions knowing he will never step onto a court with his Aztec teammates again. Head coach Brian Dutcher was also emotional talking about his seniors who have played their last game as Aztecs, adding his praise on the legacy they have left at SDSU. Hemsley and Watson, with 5:57 left and a 57-46 deficit, watched sophomore forward Jalen McDaniels foul out, and freshman forward Aguek Arop was his replacement for the remaining minutes. 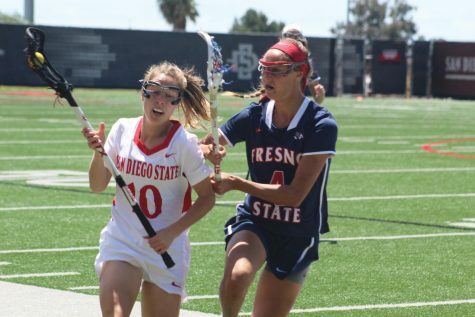 Things seemed to be falling apart for the Aztecs, who lost their leading scorer, but the team was still able to cut into the 11-point deficit. Watson hit a 3-pointer with 3:50 left to cut the Aggies’ lead to single digits at 57-49. The Aztecs cut it as close as five points when sophomore forward Matt Mitchell knocked down a 3-pointer to make it 57-52 with 2:41 left. 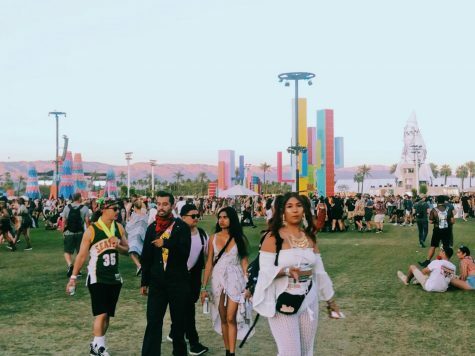 However, since the time McDaniels fouled out, the Aztecs had even more opportunities and good looks to come back but missed more than they made. In those final six minutes, SDSU shot 4-for-15 (26 percent) from the field and 3-for-9 (33 percent) from 3-point range. Shooting 33 percent from three may not seem that bad, but the amount of wide-open looks the Aztecs had makes that 33 percent a bit more disappointing. Arop and Mitchell combined for three wide-open looks from distance that didn’t fall. Mitchell went 1-for-5 from beyond the arc in the final three minutes. Dutcher said SDSU had the opportunities from 3-point range to come back but did not cash in. Watching from the bench with his five fouls, McDaniels said despite the effort, his team did not make enough key shots down the stretch. Utah State didn’t make all its shots either but made enough to topple the Aztecs. The Aggies shot 40 percent from the field, compared to SDSU’s 33 percent. Junior guard Sam Merrill – the Mountain West Player of the Year and conference tournament MVP – led the way for Utah State with 24 points. Hemsley, Merrill’s primary defender, kept the Aggies’ star in check early. Merrill started off with four points on 2-of-6 shooting, 0-of-4 from distance in the first 15 minutes of the first half. Hemsley’s defense on Merrill limited him to nine first-half points which led to a closely-fought first half. The Aztecs trailed Utah State 34-32 at the break, and there were 10 lead changes and seven ties. Watson led SDSU with 12 first-half points on exclusively 3-of-7 shots from 3-point range and added another victim to his 3-point shot fake speciality that helped him go 3-for-4 from the free-throw line. McDaniels, on the other hand, went for a quiet four points on 2-of-5 shooting before intermission. Merrill was slow to start offensively as he had only two points through the first 11 minutes, finishing the half with nine points on 3-of-9 shooting and 0-for-4 from beyond the arc. Instead, the SDSU defense gave up looks to sophomore guard Abel Porter and freshman center Neemias Queta – Porter had 10 points on a perfect 4-for-4 shooting and Queta had 11 points on 3-for-5 from the field. The Aztecs shot 42 percent from the field while Utah State shot 41 percent.